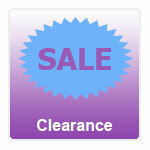 JoBananas Body Jewellery stock a huge range of belly bars and rings in a fantastic range of styles sizes and materials. 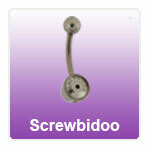 We sell everything from plain and simple bananabells with jewelled and non jewelled balls to more intricate claw set, jewelled pieces for that special occasion or when you really want to get your belly piercing noticed. Here at JoBananas we know that there is not really a one size fits all policy when it comes to a belly button piercings. We always try to give the customer the most choice when it comes to shaft lengths. 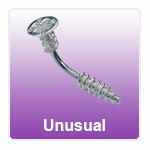 Many of our steel and Titanium belly bars are available in 6mm, 8mm, 10mm, 12mm, 14mm and 16mm. 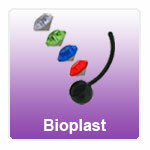 PTFE belly bars are normally sold with shaft lengths of upto 30mm but can be trimmed to whatever size you like with either a sharp craft knife or scissors while our Bioplast and Bioflex belly belly bars are available in lengths up to 24mm. JoBananas give you a great choice of materials for your belly jewellery ranging from standard plain steel, gold plated steel, Black PVD, Titanium, Bioflex, Bioplast to coloured acrylic. 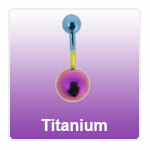 Our Titanium belly rings are offered in a vast range of anodised colours that we add ourselves before your order is sent, including bronze, blues, pinks, purples to more exotic choices such as rainbow, two tone and oil slick. 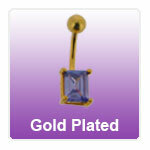 There are a vast range of belly bar types available. Plain bananabells typically consist of a larger bottom ball and small top ball and these are either plain balls or can have jewels set in them. Normally the smaller top ball is screwed off to enable it to be inserted in the piercing and the larger ball sits inside the actual belly button. 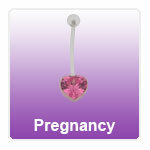 Dangly belly bars are similar the the above but with the addition of a charm or chain that hangs from the botom of the larger ball. Reverse belly bars are a little different as they are inserted through the top of the piercing and the smaller ball sits in the belly button. The jewels or charms then hang over the belly button covering it up. 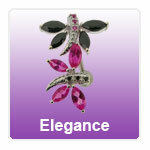 These are also sometimes called top dangle belly bars when the charm swings freely. 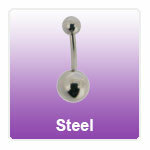 Through the Navel is a name for belly bars that look like an item is passed though the piercing. 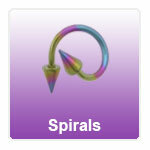 Examples of these are lizards, screws or dragons where the head and tail of the item is split on either side of the shaft. 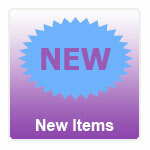 These can look quite effective and unusual. Belly Rings or Ball Closure Rings are a circle or ring that is passed though the piercing and held in place by the horns of the ring gripping on a ball that has dimples on each side. 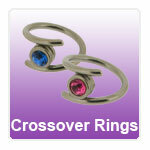 These can be a little trickier to fit when you first have them but you quickly get the hang of them. 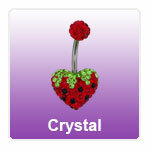 The balls can be plain, jewelled and even have a small charm dangling from them. 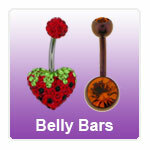 Maternity Belly Bars are longer flexible bars for use whilst pregnant, we have lots of information about them in our Pregnancy Belly Bar section (see link below). If you have always fancied a belly ring but were not so keen on the idea of piercing of your body then why not try one of our exclusive non piercing, clip on belly rings. 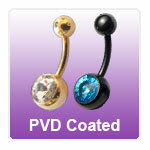 These use a patented spring system to hold on to the skin at the top of the belly button and look really realistic. 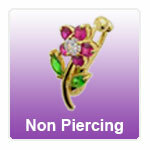 They can simply be removed when not required so make them ideal for nights out, clubbing, parties etc and are especially ideal for people who are not old enough to get pierced or their parents are not happy with the idea.